Summer brings out my burger craving in a big way! Sure, there's that whole outdoor grilling thing but, actually, I love mine made in burning hot cast iron pan in my own kitchen. However they're made, though, I've been wanting them non-stop. As it happens, my friend, Kita, from Girl Carnivore is hosting a burger month - 31 days, 31 burger recipes by 31 amazing bloggers. And there are cool giveaways, too, so be sure to enter the raffle at the bottom of this post. Every day I see what my fellow #BurgerMonth bloggers made and, every day, I say "Ooh, I want that and oh, I want that, too!" But I had to decide what flavors I would contribute to the party and my love of Greek food meant we're taking a trip to Greece via my cast iron pan. 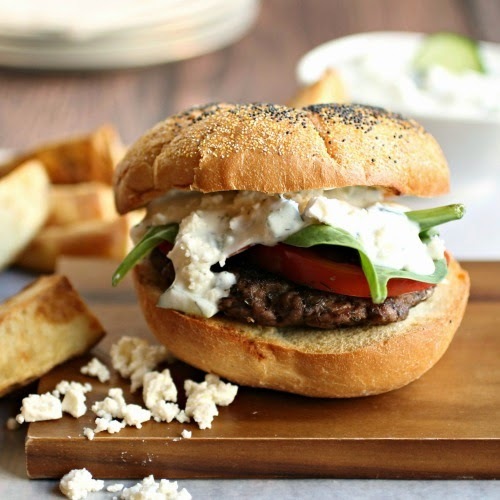 Creamy tzatziki sauce, the salty bite of fresh feta, crispy baby spinach and plenty of oregano. Oh, yes, Greece was a good place to go for a burger. Enjoy! Season your beef patty with salt, pepper and the oregano on both sides. Heat the oil in a cast iron pan and cook the beef to your desired doneness. Combine all the ingredients for the tzatziki sauce in a bowl and mix. When your burger is cooked the way you like it, spread a tablespoon of the sauce on the bottom of a toasted roll, add the burger, tomato slices, spinach and remaining sauce. Sprinkle on the feta cheese. I love bacon cheeseburgers topped with onion rings and BBQ sauce, but that burger above looks amazing, too! Looking forward to trying out the recipe. I make an awesome burger topped with crab, Hatch green chiles, & Monterey Jack cheese--so damn good-really! I've made some epic burgers, but burgers with grilled pineapple, brown sugar BBQ, bacon and swiss on Hawaiian sweet rolls have been our favorite lately. I mix hamburger, chopped jalapenos, worcestershire sauce, chopped onions, garlic powder, season salt, pepper together. Grill on the grill when done if want a slice of cheese. To eat I put more slices of jalapenos(I like them), slice of tomato, slice of onion, lettuce. I like my burgers!!! 1/2 beef, 1/2 maple sausage mixed together and made into patties. Top the burgers w/grilled onions, pepper jack, avocado and bbq sauce. They are amazing! I love to do freshly ground chicken with lots of thyme, pan seared and then eaten on whole wheat buns. My husb will even eat them! I LOVE anything Greek food related. 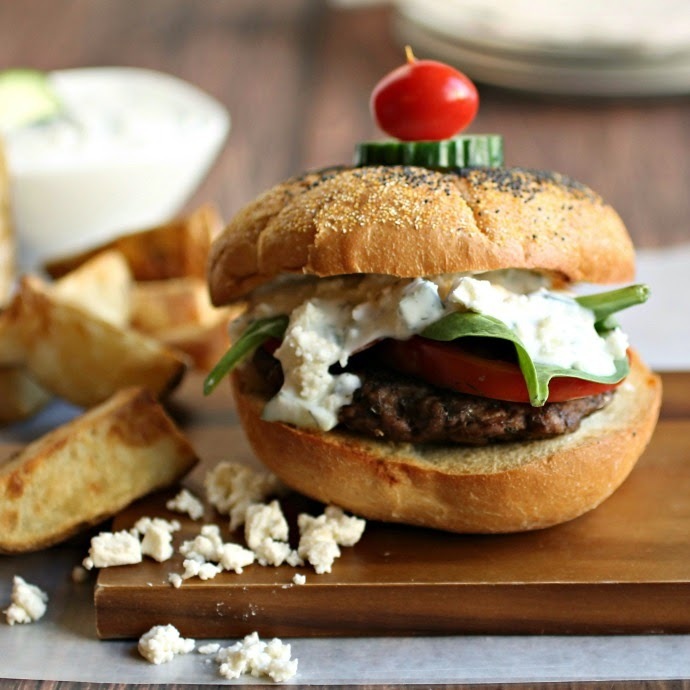 This burger with the tzatziki sauce on top sounds so good! chicken burgers layered w tomatoes avocado crispy onion rings and mayo aioli! 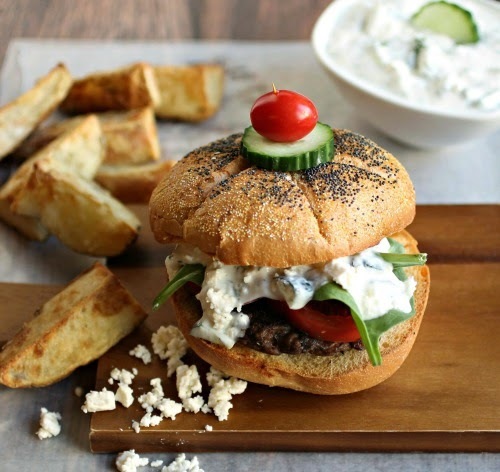 You had me at tzatziki! Then you put it on a burger. Genius. Thanks for sharing with #burgermonth.